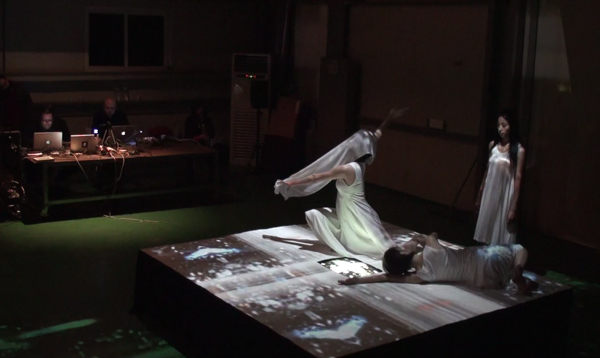 (sound and video) with dancers/performers and participants movements. it denotes circular images which are drawn, painted, modeled, or danced. "An ambience is defined as an atmosphere, or a surrounding influence: a tint. Ambient music is intended to induce calm and a space to think. It must be able to accommodate many levels of listening attention without enforcing one in particular." with electricity and movement into a contemplative environment. to place. It seems that people forget how to slow down and really focus on something. INSIDE/OUTSIDE is an attempt to allow the viewer the space and time to contemplate. The work’s pace and cadence is deliberately slowed down to counteract the fast pace of the city. performance space triggering sound and video in the computer with foot switches located around the installation. recordings and guitar interact to create a spiraling soundtrack. 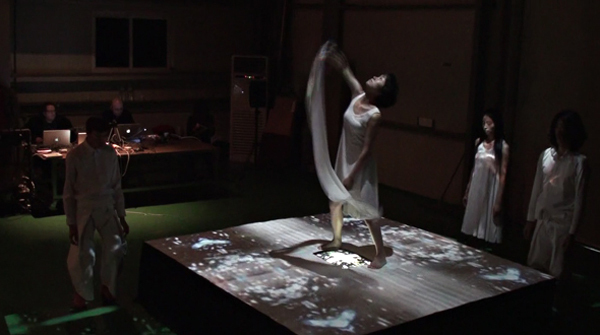 The video is a series of loops triggered by the dancer's movements. The movement by the dancers is also based on these circular formations. much by the musicians sounds and pre-existing parameters for movement as it is by the chance and ambient sounds/images from outside. 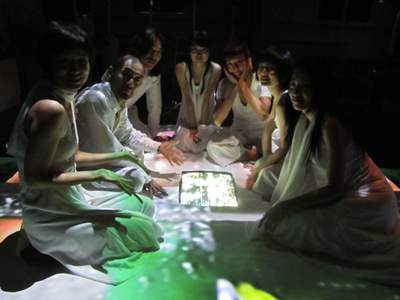 The performance will be improvisation within a structure. I am collaborating with performers to define the movement within the space. The dance/movement will be in time with the music and will also be ambient. of the opposing elements of inside/outside as well as time in its movement clockwise and the counter movement counter-clockwise creating a visual tension. Movement/performance will happen on the inside platform with an interaction with foot switches and in a circle around the outside edge of the installation. Dancers/participants movements will affect the sound and video mix. The viewer will encounter the space with spiraling performer(s) and music/sound and depending on where the person is, the music sound will change. installation/sculpture on the platform where foot switches are to interact with the installation. 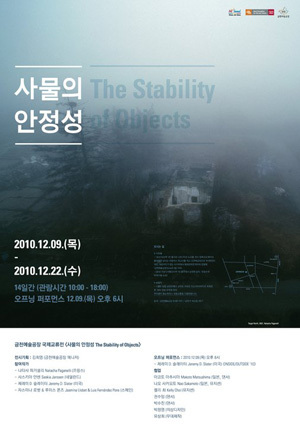 staff at the Geumcheon Art Factory (Seoul Art Space).